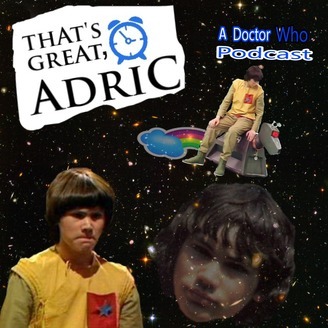 'That's Great, Adric' is an irregular Doctor Who podcast hosted by SeannieWan and Adric... kind of... that focuses on the Bigger Picture. Together, these companions will view/ are viewing/ will have/ may one day have viewed the entirety of 'Doctor Who' - as in the 26 years of what those in the 'Doctor Who Know' call 'Classic Doctor Who,' and the current decade-plus run of what those same people/ possibly different people label the 'Modern Era' of 'Doctor Who.' Adric has a Gameboy for when he gets bored. For over half a century, the BBC has transmitted a science-fiction television program about a humanoid alien and his adventures traveling through all of Space and Time with a companion or two... and for a few years, with Adric. 'Doctor Who' has seduced millions of socially anxious and awkward people of all ages. It has been a passion project, a cult hit, and now a worldwide phenomenon. That's Great, Adric! ...Really, really great. Some of the word combinations in the small passage above this one make up the names of a few stories from Series 11. These word combinations have something else in common- these word combinations make up the names of the stories That's Great, Adric were able to stomach enough to either completely sit through, or were able to make an attempt to completely sit through. Chris Chibnall has turned in his assignment to the BBC, which, in turn, has transmitted the final work to the world. The assignment given to Chris Chibnall was as such- "Wrie and produce one full series of Doctor Who (though not quite as full a series as those that the showrunners responsible for Doctor Who during the 54 years that Chibnall was not the showrunner were required to produce), featuring a female Doctor for the first time, using her gender as the focus of all marketing, and a plethora of characters in addition to the brand new, female Doctor, that take up most of the room on the T.A.R.D.I.S console set and enough of the written dialogue to make it impossible for any character, including the characters just referenced and the female Doctor, to have any depth." To say that Chris Chibnall really "Broadchurched" his assignment would be too mild a measurement of his success. That's Great, Adric believes that critics and fans of Doctor Who a few decades from now will say that Chris Chibnall really "Crappy Torchwooded" Series 11 and no other Doctor Who showrunner before or after could have "Crappy Torchwooded" Series 11 the way Chris Chibnall has. Welcome fellow travelers through Time and Space! We are most grateful that you have chosen to take a short interdimensional trip with us! 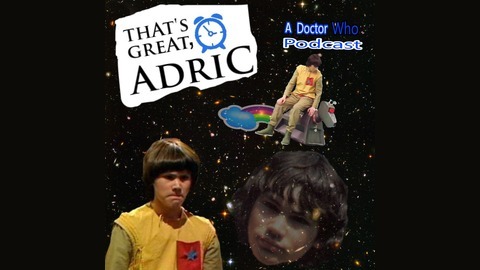 This episode of That's Great, Adric is a study of the most recent series of Doctor Who, which is called Series 11 as it is the 11th full series of Doctor Who since the program returned. In addition, we will be taking an in-depth look at how difficult it has been for That's Great, Adric to make it through a full story. One might say that it has been really, really, REALLY difficult. A Doctor Who Podcast... and it's really really great. Adric would like to quietly acknowledge, and SeannieWan would like to give a great, big shout-out to Andrew Allen for his unbelievably creative Doctor Who Funk Theme. You can find more of his work on his YouTube Page. Check out the RSS feed home for That's Great, Adric. You can find out all the information you may or may not need to enjoy the show; or you may skip the website altogether and still enjoy the show; or you might check it out as initially suggested at the beginning of this sentence and then enjoy the show the same as you would if you hadn't checked it out at all, despite the suggestion to do so; and of course, obviously, vice versa to any or all of the above or a different thing entirely if that be a better course of action for you. Find out more on the That's Great, Adric website.